"Graduate from college, get a good job, save 10% of your paycheck, buy a used car, cancel the movie channels, quit drinking expensive Starbucks mocha lattes, save and penny-pinch your life away, trust your life-savings to the stock market, and one day, when you are oh, say, 65 years old, you can retire rich." Since you were old enough to hold a job, you've been hoodwinked to believe that wealth can be created by blindly trusting in the uncontrollable and unpredicatable markets: the housing market, the stock market, and the job market. I call this soul-sucking, dream-stealing dogma "The Slowlane" - an impotent FINANCIAL GAMBLE that dubiously promises wealth in a wheelchair. Accept the Slowlane as your financial roadmap and your financial future will blow carelessly asunder on a sailboat of HOPE: HOPE you can get a job and keep it, HOPE the stock market doesn't tank, HOPE the economy rebounds, HOPE, HOPE, and HOPE. Do you really want HOPE to be the centerpiece of your family's financial plan? Drive the Slowlane road and you will find your life deteriorate into a miserable exhibition about what you cannot do, versus what you can. For those who don't want a lifetime subscription to "settle-for-less", there is an alternative; an expressway to extraordinary wealth capable of burning a trail to financial independence faster than any road out there. And shockingly, this road has nothing to do with jobs, 401(k), mutual funds, or a lifestyle of mediocrity. 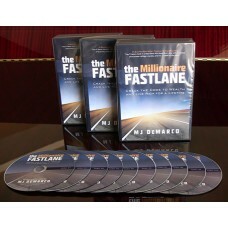 THIS AUDIOBOOK IS NOW EXCLUSIVELY SOLD AT AUDIBLE.COMTHE MILLIONAIRE FASTLANE at Audible.comThe Mill..